The NBA is diving head first into the world of sports betting. The league announced Tuesday that it has aligned with MGM Resorts International in a partnership that will make MGM the NBA’s official gaming partner. That’s a first for a major professional sports league in the United States. The value of the agreement has not been disclosed, but ESPN is reporting its value to be “at least” $25 million over three years. "Let's take advantage of this opportunity and do something historic." The partnership also allows MGM to use official NBA and WNBA data and branding, including team logos, “across MGM Resorts’ land-based and digital sports betting offerings” around the country. In turn, MGM will be promoted “across the NBA’s digital assets,” including NBA TV, NBA.com, the NBA app and the NBA’s social media platforms. 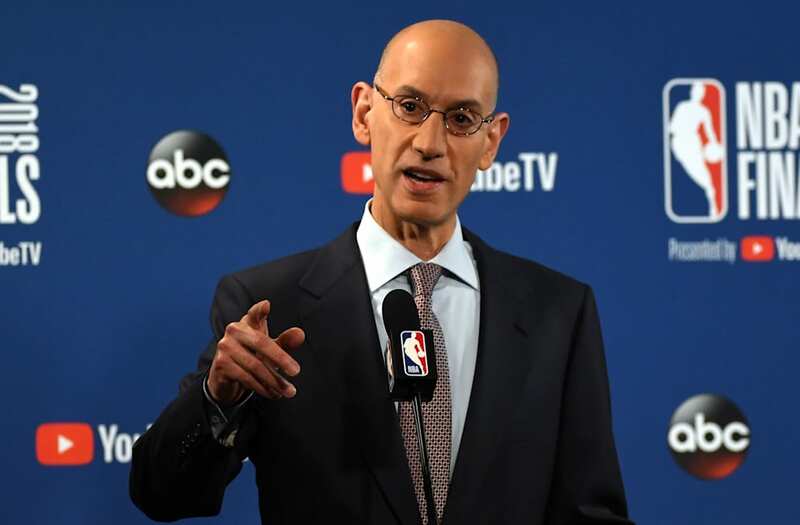 In a press conference, Silver said the designation — “the official gaming partner of the NBA” — is the only thing that makes the deal exclusive to MGM. The news comes on the heels of the United States Supreme Court’s May decision that ruled the Professional and Amateur Sports Protection Act unconstitutional. That opened the door for sports gambling to be legalized across the country. And in the weeks since, sports betting has been legalized in Delaware, New Jersey and Mississippi. Those states joined Nevada with more states planning to follow suit.